The Pacific War Online Encyclopedia: Bissel, Clayton L.
Table of Contents Next: Bisset, Arthur W.L. Clayton Bissel graduated from law school in 1917 but joined the Air Service, becoming an ace in combat in France during the First World War. Awarded a regular commission in 1920, he was assistant to Brigadier General "Billy" Mitchell for four years and was a lead pilot in the famous battleship bombing test. He spent five years as a flight instructor and attended the Command and General Staff School. He was the only fighter ace of the First World War who had remained with the air service throughout the interwar period and was serving with the War Plans Division when war broke out in the Pacific. In 1942, Bissel became Stilwell’s air chief. This brought him into conflict with Chennault, the maverick leader of the Flying Tigers. Chennault despised Stilwell and quickly grew to despise Bissel as well. 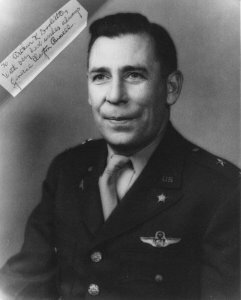 Things got so bad that Chennault eventually received his own air force command, the 14th, while Bissel remained in command of 10 Air Force. In August of 1943, Bissel returned to the United States and worked in intelligence for the remainder of the war. Bissel admitted to Congress in 1950 that he had helped cover up the Katyn massacre by the Russians through misuse of classification. Commissioned into Aviation Section, Signal Reserve. Assigned to 22 Aero Squadron.